This is a fantastic original magazine advertisement from the Art Deco period. 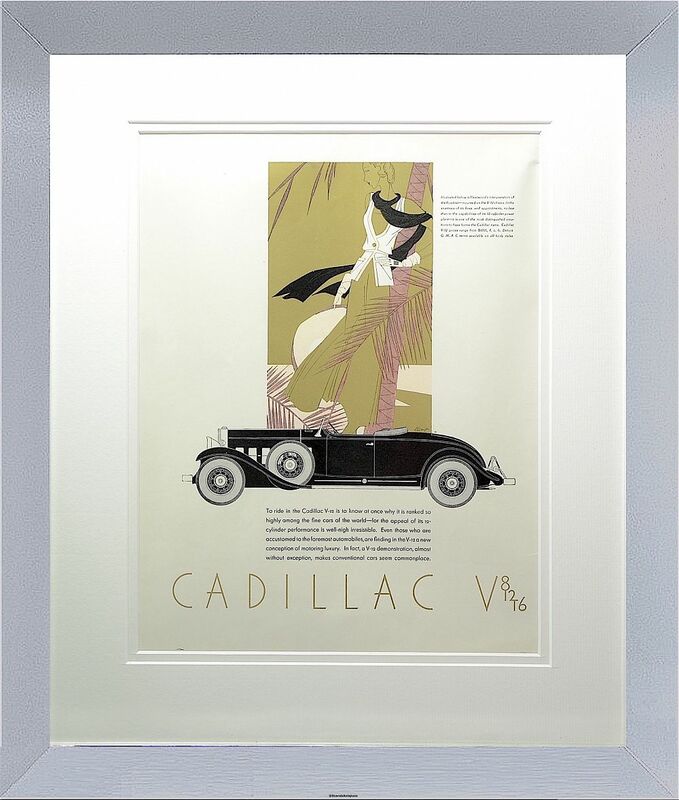 This is signed "L Benigni"and depicts a black Cadillac in the foreground with descriptive text and a rectangular decorative section in the background depicting a stylishly dressed woman leaning against a palm tree holding a hat in her right hand. Gold metallic ink has been used in the fashion illustration. We have framed this in a double cream mount with a chrome frame. A fashion illustrator & graphic designer who created glamorous evocative Art Deco designs. He worked with fashion designers such as Jeanne Lanvin, Marcel Rochas, Elsa Schiaparelli, Lucien Lelong, Jacques Fath, Jean Patou, Nina Ricci & Cristobal Balenciaga.